WOW! 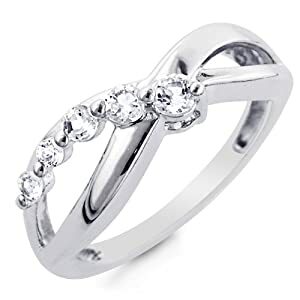 This is a *SMOKIN’ HOT DEAL* on a Sterling Silver & White Sapphire Journey Ring on Amazon. Pay ONLY $15.95!!!! This is an incredible price (75%+ OFF!) – that is sure to bounce back up once word gets out! Hurry and either grab your own now or share this deal with your hubby ASAP! This would be PERFECT as a Mother’s Day Gift! *hint hint wink wink* 😉 It would also make a nice graduation gift! The price listed above was as of 12:03 pm CST on May 4th, 2012. Prices and availability subject to change. Make sure you confirm the purchase price prior to purchase. « Reebok: 30% Off + Free Shipping! Great deal! Just picked up two for my little cousins that will be graduating 8th grade.